Anybody ever try using an electric heat source to heat the intake air? I was looking for any heat sources powered by 12 volts. How about a glow plug for a diesel? Does anyone know how hot those get? I have no idea since I've never owned a diesel. with winter coming I'm thinking of trying something like a heating element in the air filter box. figured I'd see if anyone has tried this before. Might be a bit more work than an electric heat source but the idea of a small heater core with radiator water running through it has been thrown around. You should be able to get a thermostat in there to keep the temp in the desired range for your IAT. Which seems to be pretty important with hot air intakes. An engine uses a lot of air, I wonder how many amps you would need to create sufficient heat to get the temp above where it is at. IDK, which is why I tossed the idea out there. My knowledge of electric heat generation is limitted. Which reminds me, I have an old 4 wire O2 in the cellar that I think the heater still works on. Gives me an idea! would a 12 volt hair dryer between the air filter and the throttle body make a difference? Would 2 hair dryers? up untill modern fuel injection, almost all cars ran a warm air intake that was kept at 100 degrees, pulling heat off the exaust, and monetering it with a bi-metal valve on a vaccum line, controling a vaccum motor, it's one of the simplest systems, useing wast heat. I prefer using waste energy. Glow plugs (especially the ones on our ford) do not last very long. A grid heater is a more dependable system(as in a 12valve cummins). But the amperage draw will be enough to kill a small car alternator. Our F250 diesel uses 2 group 31 batteries and still is cold natured. My old cummins dodge used one and was easier to start but it had 80ci less displacement. This is my setup. I scrounged the materials. I bent the metal with a rubber mallet on the workbench edge. Today at 30f outside I was getting 150f with only 3x14 grill opening. when you consider that engines reject the majority of the energy in the fuel as waste heat, capturing some of that rather than generating even more heat and using even more power to do so makes the folly of it pretty obvious, no? I think that hair dryers wouldn't last in an engine bay. I think they are designed for short duration use. Also, the minimum juice is in the 800 Amp range (AC), so I just don't think they are viable. That's why I was thinking of a self-heated 02 sensor. But even if it heat's itself, I don't know if it would heat the surrounding area. I think lovemysan has the best option. That's pretty obvious. Carlos pointed out that making it a warmup only device might make sense. 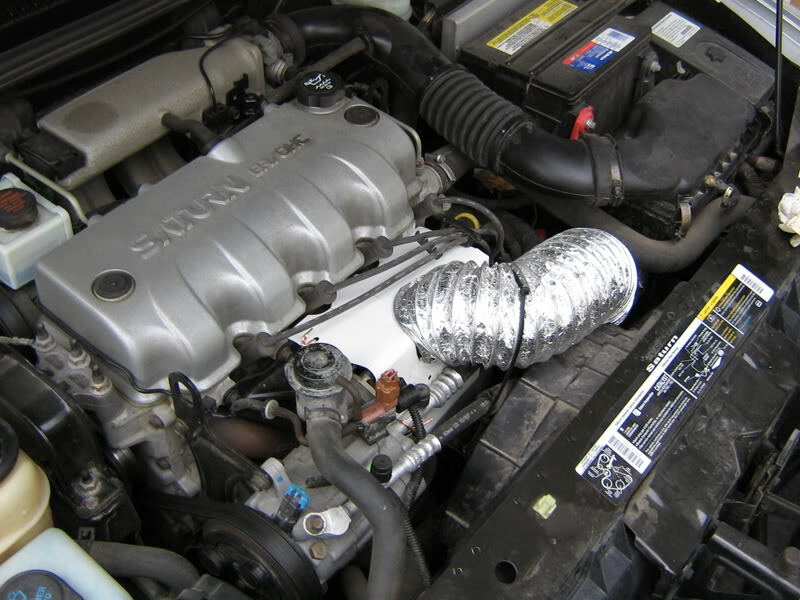 The exhaust heat collector seems effective in saturns. I was thinking (though I didn't say it) it might help out during the first 1/4 mile or so, probably don't even need fans, can just make your own nichrome wire heating element coil that sits in the tube to the injector body (appropriately suspended of course).